Heather and Megan are two sisters who write a fun blog called Quilt Story. 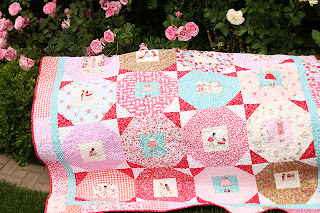 They share their own projects, quilting, sewing, crafting and write some adorable patterns. They also take submissions to share your own quilt and the story behind it! They post these several times a week so you get to see several fun perspectives on quilts. Fat Quarter Shop carries Quilt Story patterns in paper and PDF. Here is a quilt they created using the new Sarah Jane "Children at Play" line. Each block center is a fussy cut block of some of the darling characters in this line which highlights them really well. Be sure to visit their blog and pattern page!